When it comes to drawing blood, there seems to be a never-ending list of concerns faced by phlebotomists. Tricky veins, screaming children and other not-so-fun issues can make drawing blood feel like a lot more of a hassle than it should be. Of course, finding meaningful employment in the medical field thanks to one’s training in phlebotomy makes these issues manageable. Of course, every phlebotomist must also be prepared to deal with the various questions and concerns that are brought up by those in their care. And often, patients become concerned when bruising occurs around the area where a blood draw took place. ZocDoc also explains that this bruising is more likely to occur when a large-gauge needle is used for the draw, or when a phlebotomist experiences what is often referred to as a “difficult stick”—when multiple pokes are attempted before the blood sample is successfully collected. 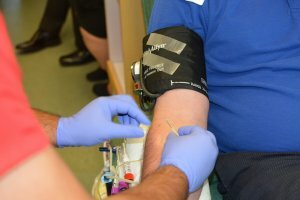 The NHS notes that damage to the blood vessel or even a lack of applied pressure at the venipuncture site can also contribute to the bruising. Even simple, everyday activities like lifting heavy objects after a blood draw can put pressure on the venipuncture site and dislodge the internal clot formed. In most cases, the bruising experienced by patients after a blood draw is nothing to be concerned about—much like the minor pain associated with a venipuncture. However, phlebotomists can do their patients a service by explaining the importance of applying pressure to the venipuncture site with a cotton pad after the blood draw (as this helps avoid bruising), and by employing other phlebotomy best practices to ensure that the entire process goes smoothly and is less likely to result in bruising or any other uncomfortable experience. With time, the familiar blue-black discoloration of the bruise changes to green, then yellowish, and then it eventually fades and disappears. This can take up to two to three weeks if the bruise is large. Note that it is normal for bruises to spread out before fading. The U.K. National Blood Service also notes that it is common for the bruise to spread or for bruising to occur “away from the donation area.” This is (once again) typically not a cause for concern, though it is recommended that patients avoid heavy lifting with the bruised arm and possibly apply compression and ice as needed to help the bruised area heal. Clothes with loose-fitting sleeves are the best choice for donating blood. A tight sleeve can function just like a tourniquet, causing congestion in the vein, and increasing the likelihood of bruising. Applying firm pressure to the venipuncture site after donation until the bleeding has stopped will also help. Cover the venipuncture site with a band-aid or taped cotton ball that should be kept on for at least six hours. Avoid lifting heavy objects for a few days after donating blood. As mentioned, this can exacerbate any bruising. Gentle movements are recommended while the bruise is healing. If bruising has developed, apply ice or a cold pack to the area to help alleviate any pain or discomfort. Avoid aspirin or ibuprofen for at least 24 hours. If you still require pain relief, acetaminophen (like Tylenol) is recommended. Typically, the bruising will go away after a day or two, but in the unlikely event that the pain becomes severe, that the area begins to swell or become inflamed or other unusual symptoms occur, it is best to contact a medical professional immediately. However, such occurrences are quite rare. As many a phlebotomist has already learned, blood draws are a safe and important part of the medical process with minimal risk—even if mild bruising sometimes happen.